This article will serve as a reminder of the Pipeline UI as much for the writer as for the reader. The Pipeline UI requires the MapMeduce library to be installed. If you are not familiar with MapReduce please refer to the MapReduce API Series of articles. Once MapReduce is installed you will need to add a few indices to index.yaml to properly query for pipeline records for display in the UI. This URL will list all root pipelines in the system, ordered by their starting time. You can filter pipelines by their class path and check on an individual pipelines status using this UI. If you know a pipeline’s root identifier you can jump directly to the status page. This page presents you with a UI displaying the status of a pipeline and any of the pipeline’s children. If your pipeline is a MapReduce job, it will have an entry on the MapReduce status page. You can navigate to individual jobs to check their sharding and processing status or cleanup a job by removing datastore entries for the pipeline. If you know a mapreduce job’s identifier you can jump directly to the status page. 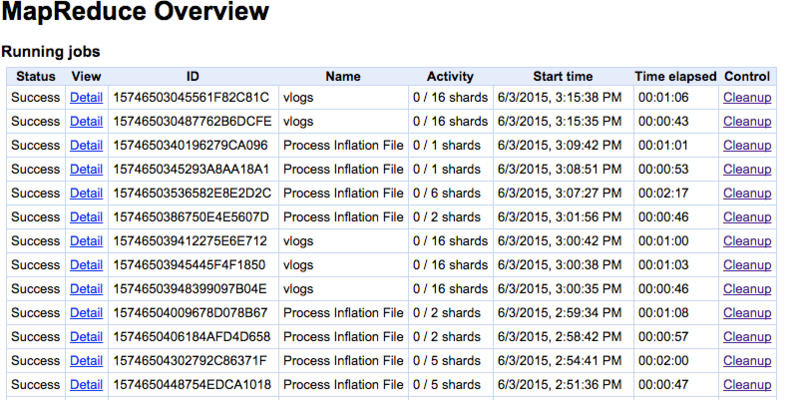 This page will show any counters you have defined and show how the processing of each shard of data.